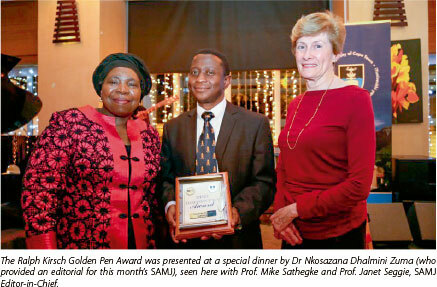 Professor Mike Machaba Sathekge, Head of the Department of Nuclear Medicine, University of Pretoria, and Steve Biko Academic Hospita was the inaugural recipient of the Ralph Kirsch Golden Pen Award created to recognise the most cited paper* in the Google Scholar Database published in the SAMJ in 2010. This prize is associated with three institutions - Groote Schuur Hospital and the University of Cape Town through the Department of Medicine, and the South African Medical Association through the SAMJ - to which Ralph Kirsch dedicated his life. The article has been cited in Russian and Chinese medical journals and research aggregator sites. * Sathekge MM, Maes A, Pottel H, Stoltz A, van de Wiele C. Dual time-point FDG PET-CT for differentiating benign from malignant solitary pulmonary nodules in a TB endemic area. S Afr Med J 2010;100(9):598-601.